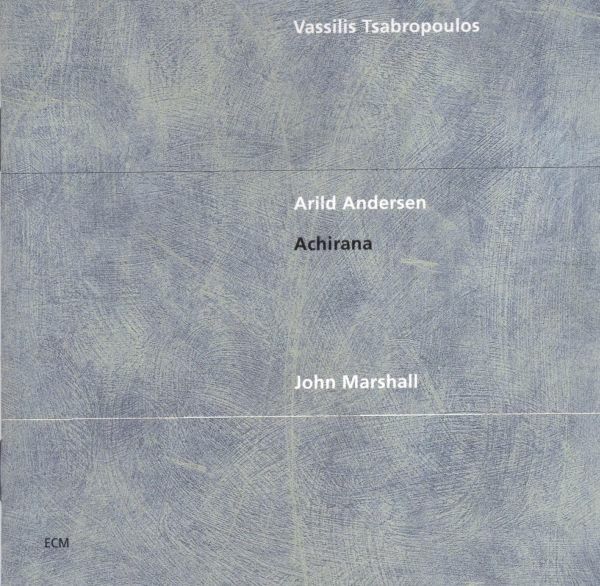 Achirana» marks the debut of a new trio, formed by ECM bassist of the first hour Arild Andersen and featuring, alongside veteran drummer John Marshall, Greek pianist Vassilis Tsabropoulos in his first recording for ECM. Likely to be hailed as a veritable ?discovery? in jazz circles, Tsabropoulos has long been recognised as an exceptionally gifted performer in other idioms. To quote Vladimir Ashkenazy, «Vassilis Tsabropoulos possesses rare talent». He has a reputation as a classical pianist, an interpreter of 19th and 20th century music, and as a conductor, and there is growing recognition for both his composing and his improvising. A prodigy, Tsabropoulos was winning music competitions from the age of 10, and after graduating from the Athens National Conservatory, continued his studies ? on an Aristotle Onassis Scholarship ? at the Paris Conservatory, the Salzburg International Academy, and the Juilliard School, with teachers including Rudolf Serkin, and Tatyana Nikolayeva. Tsabropoulos (born in Athens in 1966) has made the works of Beethoven, Mozart, Chopin and Schu-mann central references in his performance repertoire but is also a committed advocate of Russian music, frequently playing the works of Rachmaninov. Prokofiev and Scriabin. His compositions (works for piano, violin, string quartet, and more) include the «six Preludes» which he wrote especially for Vladimir Ashkenazy. Amongst current projects in the classical arena are a tour of the U.S., recitals in Britain, performances of Mozart in Sweden, conducting in Scandinavia, work with the Czech Philharmonic in Prague, recordings of Chopin and Schumann… and then there are the jazz commitments. One of the great contemporary bass players, his magisterial tone instantly recognisable, Arild Andersen was born in Norway in 1945. From 1964 onward he played with the top musicians in his country and was a founder member, in 1967, of the Jan Garbarek Trio, soon to become a quartet with the addition of Terje Rypdal. Andersen spent six years with Garbarek and appears with him on the ECM albums «Afric Pepperbird», «Sart» and «Triptykon». In this period he also played extensively with George Russell and Karin Krog, and was heard in concerts with Don Cherry, Phil Woods, Hampton Hawes, Johnny Griffin, Art Farmer and more. In 1973-74, Andersen was based in New York, where he worked extensively with Sam Rivers (in a particularly explosive trio with Barry Altschul on drums) and Sheila Jordan, and also gigged with Paul Bley, Stan Getz, Steve Kuhn, Roswell Rudd and others. On returning to Norway he began to lead his own groups, many of them documented on ECM recordings including «Clouds In My Head», «Shimri», «Green Shading Into Blue», «Lifelines» (with Kenny Wheeler and Paul Motian), «A Molde Concert» (with Bill Frisell, Alphonse Mouzon and John Taylor), «If You Look Far Enough» (with Ralph Towner and Nana Vasconcelos), and the trilogy «Bande A Part», «Aero», and «Re-Enter», with Masqualero, the band Andersen led for a decade and which featured Nils Petter Molvær, Jon Christensen and Tore Brunborg. In recent years he has made explorations of Norwegian folklore one of his priorities in his group with singer Kirsten Bråten Berg (heard on the album «Sagn»), has engaged in a fascinating collaboration with the Cikada String Quartet («Hyperborean») and formed an alliance with German trumpeter Mar-kus Stockhausen (a new ECM album is in preparation). For the third member of the trio Andersen chose British drummer John Marshall. «John?s a player I?ve enjoyed working with in different contexts. He has a special approach to piano trio playing where he?s able to play quite freely and subtly without losing that power and forcefulness that he has.» John Marshall was born in Isleworth, England, in 1941. His drum teachers included Philly Joe Jones and Allan Ganley. Admiration for the work of Charles Mingus in particular encouraged him to explore both the physical/emotional attributes of blues influenced music and the more «intellectual» component of modern jazz. To follow both of the streams in London in the early 60s necessitated playing in a number of bands: Marshall worked with Alexis Korner?s Blues Incorporated, the Joe Harriott-John Mayer Indo-Jazz Fusions group, the Graham Bond Organisation, John McLaughlin, Dave Holland, John Surman, Alan Skidmore and others. In 1969 he was a founder member of the early jazz-rock group Nucleus, leaving it in 1971 to tour and record with Jack Bruce. From 1972 he was drummer of Soft Machine, eventually becoming the group?s co-leader with Karl Jenkins. During the 1970s and early 80s he also played with many visiting American musicians including Gil Evans, Mary Lou Williams, Ben Webster, Roy Eldridge, Milt Jackson, Charlie Mariano, Larry Coryell and Gary Burton. Marshall has also performed with classical and new music ensembles, working for instance with com-posers (and Stockhausen associates) Tim Souster and Roger Smalley, and has retained an interest in free improvising over the years, from early work with the Spontaneous Music Orchestra to the criti-cally acclaimed contemporary trio Marshall-Travis-Wood. He made his ECM debut in 1977 as a member of Eberhard Weber?s Colours. Since then Marshall has been heard most often in the company of John Surman, both with the Surman Quartet (as on the prize-winning «Stranger Than Fiction») and the John Surman-John Warren Brass Project. He has also worked regularly with Arild Andersen over the last decade, often in configurations involving trumpeter Uli Beckerhoff and/or guitarist John Abercrombie. The «Achirana» trio is often on tour in Europe. For details consult the ECM Web site at www.ecmrecords.com.